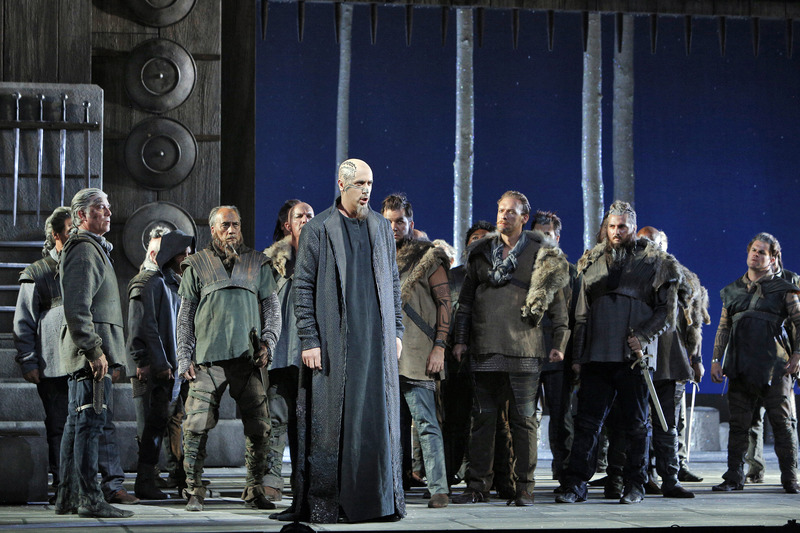 Christian Van Horn as Druid leader Oroveso, with the San Francisco Opera Chorus, in “Norma”. Photo Credit: Cory Weaver. This new production of “Norma”, directed by Kevin Newbury, reminded me of the mythical pushmi-pulyu of Dr. Dolittle fame, in that it appears to be an animal with two heads, struggling against each other to take matters in opposite directions. The musical production is magnificent, offering a spectacular rendition of Bellini’s bel canto masterpiece, pulling us towards opera heaven. Alas, the unfortunate staging pulls in quite the opposite direction. The lengthy overture offers ample opportunity to introduce us to the action of the drama, but it is an opportunity missed. Norma stands and gazes at the moon. And stands. And stands. And stands. She turns, strikes a new pose, and stands some more. She seems more like a mannequin in a window display then a priestess about to prepare her people for war. As she stands and poses, two oddly costumed stage hands (surely we are not expected to believe they are druid priests) adjust pulleys and ropes to fly in a presumably sacred artifact of a tree with all the religious solemnity typical of working a fork lift. The stage director’s primary directive — to tell the story — seems to have been completely ignored. The opening chorus, Ite sul colle, o Druidi, does not fare well dramatically as the Druid singers, presumably preparing for war against the Roman occupation, move and emote with such languidity and lack of purpose that they appear to be refugees from an Esther Williams movie, dancing under water. But, when Sondra Radvanovsky as Norma launches into the prayerful Casta Diva, the singing blessedly takes over. It is not enough, however, to make the production work as well as it ought. And so it goes for three long hours, with passages of sublime singing interspersed with dull and pedestrian staging which fails to engage. The music is inspiring, but the narrative is unnecessarily muddy and dull. Some of the staging gaffes are downright laughable. The chorus repeatedly enters on one side of the stage, clumped together like bits of curdled milk, looking confused and disoriented, anything but battle ready. On one occasion, they respond as a group with vague muttering in such an obvious bit of fakery that my companion (a playwright of some distinction, whom I won’t embarrass by identifying) had to stifle a fit of giggles before returning to his nap. I was grateful that he does not snore. 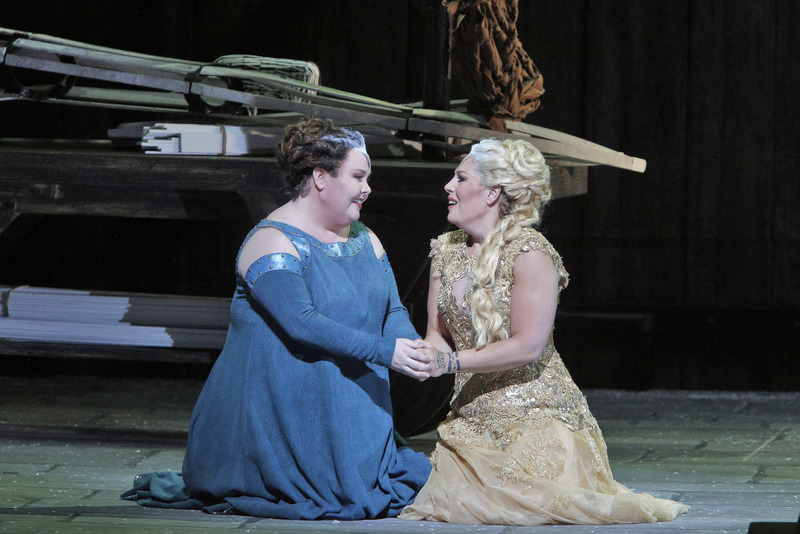 Jamie Barton as Adalgisa and Sondra Radvanovsky as Norma together scale the heights of bel canto artistry. Photo Credit: Cory Weaver. In addition to Radvanovsky’s singing, there are two elements of this “Norma” that are quite wonderful. Firstly, and emphatically, Jamie Barton makes a stunning SF Opera debut as Adalgisa, the young priestess who is Norma’s rival for the love of a Roman occupier. When Barton and Radvanovky sing the famous duet, Sola, furtiva al tempio, the production springs to life. The rendition is musically perfect, the two voices gorgeously blending, every detail of supple melody delineated with care, no harmony lost. The two divas communicate passion and joy in the music that is the emotional highlight of the entire production. It is lovely in every way. Secondly, Jacqueline Piccolino, a first year Adler Fellow, sings well and demonstrates notable acting skills in the role of Clotilde. A full production of a grand opera should be as thrilling for its narrative and stagecraft as it is for its singing. As a concert performance, this “Norma” would have been grand indeed, but as a fully staged theatrical event, it is rather disappointing. “Norma,” by Vincenzo Bellini, text by Felice Romani, based on a play by Alexandre Soumet, co-produced by San Francisco Opera, Gran Teatre del Liceu, Barcelona, Canidan Opera Company, and Lyric Opera of Chicago. Director: Kevin Newbury. Set: David Korins. Costumes: Jessica Jahn. Lighting: D. M. Wood. Conductor: Nicola Luisotti. Chorus Director: Ian Robertson. Oroveso: Christian Van Horn. Pollione: Marco Berti. Flavio: A. J. Glueckert. Norma: Sondra Radvanovsky. Adalgisa: Jamie Barton. Clotilde: Jacqueline Piccolino. Norma’s Chidlren: Oliver Kuntz and Miles Sperske. Posted in Reviews.Tagged Charles Kruger, Christian Van Horn, Jacqueline Piccolino, Jamie Barton, Kevin Newbury, Norma, San Francisco Opera, San Francisco Theatre Reviews, Sandra Radvanovsky, theatrestorm, Vincenzo Bellini.